I am sure many expected old age to take Bob Dylan away, allowing him to rest on his laurels and continue his eternal tour, playing to those old and young that still obsess over his string of 1960/70’s epic albums, thinking, “it cannot and will not ever get any better than this,” a notion that were it not for the extraordinary nature of his recent output, just might have come true. From 1962 through 1970 Zimmy released at least 10 bona fide, mesmerizing, five-star classics(1), albums that continue to affect the progress of folk, rock and pop music to this very day. By 1970 Dylan was suddenly 29, with arguably the best work of his lifetime behind him. For the next 27 or so years he continued, perhaps in an effort to keep busy, but more than likely in an effort to top his earlier work, creating multiple, deformed versions of his past-self, from recluse, to born-again Christian, to the leader of the Rolling Thunder Revue, his musical caravan, white pancake make-up included. By continually changing with the times he did deliver the occasional, unexpected studio classic along the way(2), but, with the exception of the sequential Blood on the Tracks and Desire in 1975-76, he never came close to recreating the hot streak he achieved through his 20’s(3). However, in 1997 he released Time Out of Mind, presenting us with his latest and potentially last character, the aging sage, narrator of the secret oddities of America’s underground history, embracing his gravelly, somewhat pitchy voice as a tool to unify near-spoken-word with history-defying-poetry – music included at no additional charge. It turns out that Time Out of Mind was the precursor to an amazing decade of creative output – Bob in his 60’s is every bit as interesting as Bob in his 20’s. He has stories to tell, and he’s read and experienced a lot in the last 30 years, providing him with a deep, obscure library of influences to draw (steal) from. Time Out of Mind was the beginning of his recent winning streak, which was followed by “Love and Theft” (2001), Modern Times (2005), Together Through Life (2009), and yes, the covers record, Christmas in the Heart (2009). 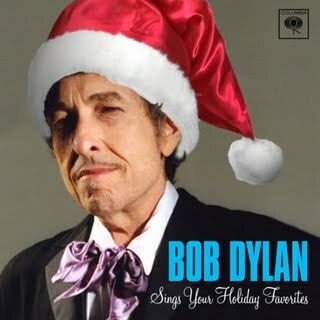 While deep down I would love for this to be a review of Christmas in the Heart so I could introduce you to the creepy-old Uncle Bob, lurking in the corner, kids on his lap, bourbon bottle in his pocket, butchering Christmas carols with good cheer – the task at hand, I suppose, is to pick his best album of the decade – and that I will – with the caveat that they all stand up to the best work of Bob’s career, regardless of his then-age and predilections. In fact, they all stand up to the very best of any genre of music released over the past decade. Go figure – from the age of 56 through his up coming 70th birthday – Bob Dylan has equaled in quality his historic output from 36 years prior while remaining relevent as a contemporary artist, no doubt a once-again, near one-of-a-kind achievement. “Love and Theft” came out on 9-11-2001, but I did not get my hands on a copy until at least six months later, and I did not start listening to it obsessively until years later, when I decided I liked Modern Times so much I wanted to compare it to “Love and Theft”. In truth it was in the earlier part of this decade when Bob Dylan’s music really began to blow my mind again, but then it was the old stuff I was focused on. I was working with several musicians as their artist manager and I was interested in what they were accomplishing lyrically and in turn they were inspiring me to dig more deeply into Dylan (thank you Jason Darling, Tara Angell, Kristin Hoffmann and Jesse Malin), so I began listening to everything Bob. By 2005 I was ready for his contemporary stuff, the library being so large one has to sift through it patiently, and there they were, a modern trilogy, Time Out of Mind, “Love and Theft” and Modern Times, all shiny and new and ready for me. At his best Bob Dylan tells his stories through characters that often seem to possess his very sense of being. One character that has always been around is the purveyor of American folk-lore, primarily influenced by ancient American music the likes of which is archived in Harry Smith’s Anthology of American Folk Music (AAFM), a six LP set released by Folkways Records in 1952 that archives the finest of underground folk music from the late 1920’s and early 1930’s – music that explores the lives of con-men, rogues, gamblers, cheaters, gunfighters and the like, those who, despite the backdrop of the American Dream, spin their yarns knowing they have nothing to lose. On “Love and Theft” Bob “borrows” their minds and perhaps some of their melodies, recasting new tales of weirdness and desperation along a line of contemporary poetry, the superiority of which requires forgiveness of his overt melodic theft – these are vivid stories inside of songs that you know you’ve heard before, but where? “Love and Theft” sounds like it is playing on my grandmother’s old Victrola, scratchy and weary with age, capturing perfectly some of the best melodic and orchestral tricks from the old days, jumpy blues, slow-nasty blues, rockabilly, slow dance, country ballads, up through early Rock ‘n’ Roll a la Bill Halley and Buddy Holly, stuff that moves you out-of-body to a unique time and place. The stories and the sounds evoke images of a dusty old home conservatory, occupied with an old music man, spending his day singing great old songs, soft light bleeding through the antique linen curtains. “Love and Theft” feels old and new at the same time, so familiar, yet so oddly riveting, cheating time like nothing else of its day. It turns out that Bob made a decade’s work of reminiscing and molding the old into something uniquely new. First with his studio records (produced under his pseudonym, Jack Frost). Second through his never-ending schedule of live shows, that serve as a platform for him to perform wholly new versions of his entire catalogue in the image of his newest character. And third through the fascinating collection of radio programming he produced for XM titled Theme Time Radio Hour, where Bob spent an hour each week exploring his record collection for theme-driven gems (if interested, you can download all of the shows here). From start to finish, “Love and Theft” captures the essence of Bob’s immense creative effort over the past decade and at times I think it might be my favorite Bob Dylan record, but more often my favorite Dylan record is the one I happen to be listening to at the time. Nonetheless this is his gem of gems from this past decade, for sure. The album’s title, “Love and Theft” is from Eric Lott’s book Love & Theft: Blackface Minstrelsy and the American Working Class. This past decade was a busy period for not only Bob, but for his fans and critics, with numerous packages of Dylan reminiscence released, the most notable being Martin Scorsese’s awesome made-for-TV film No Direction Home and Todd Haynes’ odd interpretation of Dylan’s life through a group of fictional characters called I am Not There (Cate Blanchett was nominated for an Academy Award for her portrayal of late sixties Bob). (1) Here are the 10: 1 – Bob Dylan (1962), 2 – The Freewheelin’ Bob Dylan (1963), 3 – The Times They Are a Changin’ (1964), 4 – Another Side of Bob Dylan (1964), 5 – Bringing It All Back Home (1965), 6 – Highway 61 Revisited (1965), 7 – Blonde on Blonde (1966), 8 – John Wesley Harding (1967), 9 –Nashville Skyline (1969), and 10 – New Morning (1970). (2) If you attempt to weed through the 20 some-odd Dylan studio releases from 1970 through 1997, consider these, which I regard as his best from that era, and are every bit as good as his sequential masterpieces from his early career: Blood on the Tracks (1975), The Basement Tapes (1975 – recorded in the late 1960s and in many ways a long ago precursor to themes explored in his more recent albums, “Love and Theft” included – see above), Desire (1976), Slow Train Comin’ (1979 – Bob talkin’ about Jesus), Infidels (1983), Empire Burlesque (1988), and Oh Mercy (1989 – his first collaboration with famed U2 producer Daniel Lanois, who also produced Time Out of Mind). 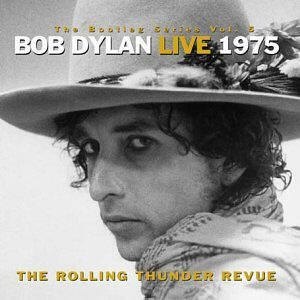 (3) All told I am recommending 17 studio albums from the period of 1962 through 1997, almost too much of anything!, yet amazing through and through, and as if that weren’t enough, the entire Bootleg Series, now numbered up to 9, most of which are multiple CD collections, is fantastic, bringing the total number of Bob Dylan albums worthy of devoted attention, including the four from this past decade, to 31!